Enhance your body-mind connection with foam roller exercises and shoulder stretches that open your shoulder muscles. You can ease the weight of the world on you shoulders! 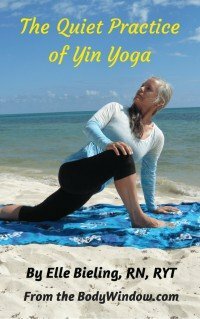 The body-mind connection is very strong and when you do these exercises, this connection can be tapped into! The shoulder is a very complex system of muscles, tendons, ligaments and bones. Because the shoulder is the most mobile of all the joints in the body it is the most prone for injuries. The shoulder has more range of motion and can move in more directions than another other joints in the body. Since the shoulder itself and its problems can be very complex, I include excellent references for your education if you desire to know more. For more information regarding the body-mind connection and foam roller exercises, see my article on Foam Rolling. A technique called self-myofascial release is utilized when you do foam roller exercises. Self myofascial release is the scientific word for breaking up the stress knots in your shoulder muscles from tension and overuse. Self myofascial release is a phenomenal physical release that allows you to reconnect with your body's messages. If you read Foam Rolling, I describe in more detail how the body-mind connection is used for healing with self myofascial release. Emotions Affect Our Body in ways we don't even realize, so when you foam roll you are giving your body a chance to speak to you in its unique way! If you have not yet purchased a foam roller, I would urge you to do so. The best size, for the most use in all different exercises is the 36 x 6 inch full round. The best style is the textured, premium versions, with high density EVA foam. The EVA makes the roller more durable and comfortable, and the textured surface increases the ease of use by providing for more traction. I love mine. The premium style is also the best if your muscles are sensitive. It is difficult to find the premium versions in stores. The best selections can be found online at places like Amazon. You can see my recommended models by clicking here. Rolling on a yoga sticky mat may also increase the efficiency of your experience. Simply stated, the shoulder is responsible for all arm movements. The shoulder joint is a ball in socket joint. The head of the humerus, the upper arm bone, fits into the glenoid cavity of the scapula (shoulder blade), like a golf ball sits on a tee. The mechanical fit of this ball and socket is not what stabilizes the shoulder joint. In order to remain in a stable or in a normal position, the shoulder joint must be anchored by shoulder muscles, tendons and ligaments. Even further, the bones of the clavicle (collar bone), and scapula (shoulder bone in the upper back) are connected with ligaments. Tendons from muscles that attach to the bones and connective tissue surrounding the shoulder joint makes up the rotator cuff. This soft tissue allows for great range of motion in the shoulder, but also can easily lead to over-stretched or torn shoulder muscles and ligaments that become shoulder injuries. While there is not much information or research regarding gender differences in the shoulder, there are overall differences in strength, speed and endurance in men versus women. Women lag the most in the strength and speed category, but they seem to be catching up in the endurance arena. It seems that women may be more suited physiologically to endurance activity than men due to an enhanced ability to conserve muscle glycogen and the ability to utilize fat for energy. This means that they are more efficient utilizers of oxygen. The female may have more lax ligaments than males, as a result of hormonal changes associated with the menstrual cycle. There is some research evidence to support this. Because of this flexibility in the ligaments, supposedly women are more prone to joint injuries and the shoulder is no exception, especially for sports that involve overhand movements, like tennis, swimming, weight lifting, baseball and softball. Statistically, women in sports have more shoulder injuries than men. Men who power lift often inadvertently cause shortening of their pectoral muscles if over-trained. It is easy for a man to over-train the pectorals when our culture admires the pectoral muscles more than shoulder muscles. This shortening of the chest muscles can cause the shoulders to slump forward, if the upper back muscles are not equally strengthened. See Foam Roller Exercises to Open the Chest to read more about this concept. This forward slump may contribute to shoulder problems. Poor posture in both sexes can also contribute to shoulder issues. If you slump forward, especially when sitting at your desk all day long, the shoulder no longer remains in the proper, upright and neutral position, causing potential shoulder problems. While female athletes may have more shoulder injuries than men, in my experience, regular guys seem to have more issues with their shoulders than regular gals. My male friends have shoulder problems, my father-in-law has shoulder problems, my husband had shoulder problems, and one of my male clients has frozen shoulders. Everywhere I look, men are complaining about limited range of motion and pain in their shoulders when they perform certain tasks, especially overhead tasks. I believe this is true, because men perceive that they carry the financial and mechanical burdens of the family and the home on their shoulders. They are the breadwinners, the fixer-uppers, the Tim the Tool Man. Argh Argh! They have stronger shoulders, broader shoulders and take their burdens seriously. Lots of forceful work with arms overhead leads to shoulder issues. Compare this to women who have more issues with their hips and pelvis, relating to issues of power and control, creativity and sexuality. See Foam Roller Exercises to Open the Hip to read about these issues. I love to use metaphors to illustrate concepts. There are many body metaphors surrounding the shoulders and they may be significant to you. Body metaphors are a result of the collective human experience of the body-mind connection. Understanding the concept of metaphors more fully is important for you to heal any shoulder issues you may have. The shoulders contain many metaphors that relate to lifting and carrying life’s burdens. Shoulders are about carrying these burdens and the posture of your shoulders reflects your joy and hope in life versus reflecting your helplessness and hopelessness. If your shoulders are slumped and rounded, the weight of your burdens are too great, and reflect this by your ‘sagging shoulders.’ We all know the metaphorical meaning of sagging shoulders. It is clearly the opposite of joy and happiness, isn’t it? When your burdens feel light you ‘throw your shoulders back’ in joy and move forward with confidence and hope! So when issues in your life come up that are heavy and need to be carried, do you then ‘carry the weight of the world on your shoulders’ and ‘shoulder the burden’ or do you ‘shrug your shoulders’ and ‘shrug it off?’ Do you ‘square your shoulders’ and get ready for the fight? Do you see the difference in the various body metaphors? The shoulders reflect our attitude toward our burdens in life. We can either perceive them as burdens or we can perceive them as opportunities for growth. If I say he has ‘broad shoulders’ doesn’t it mean that he can handle anything? Create your list of affirmations to help you shoulder your burdens that you have to carry. You can square your shoulders or have slopping shoulders, the choice is yours - it truly all does depend on your attitude. Upper back pain and shoulder pain go hand-in-hand. Prolonged sitting on your job at your computer is a set-up for bad posture, slumped shoulders and shortened, tight hip flexors. When we sit too long at work, without taking stretch breaks, we are succumbing to the control of our job, and saying that it controls our health and us! Don’t fall into this trap. You will be a much better employee in the long run and be way more productive if you take ‘health breaks’ and get up out of your chair every ½ to one hour for just one minute to do shoulder stretches and other stretches, get your circulation going again and empty your mind for a short while! Chronic shoulder pain and immobility of the shoulder joint is a real problem for a lot of folks, especially men. These foam roller exercises and shoulder stretches that I will show you will help you in opening your shoulders and will give you unique foam roller shoulder stretches for your shoulder muscles. The exercises will help you manage your shoulder pain or prevent it if you do not yet have shoulder pain. The exercises will help you release your emotional issues surrounding the burdens you have to carry. Cast your burdens to God/the Universe and say affirmations for health that will create hope and joy for the future for your life. If you desire to have more hope and joy in your life you can combine the foam roller exercises that open your shoulders with the saying of affirmations that will invite these positive emotions in. Create Affirmations for Joy and Hope. I release control to God/the Universe and I am free. I throw my shoulders back in hope and joy! My burdens are easy and my yoke is light! I stand strong and tall. My life is easy and I am free. I choose joy and hope for my life. My life is full of the pleasures that are meant for me. Make these foam roller exercises that I demonstrate below, uniquely yours. You can do this by varying the position in any way that feels comfortable for your body. Move a little left or move a little right. Vary the pressure. Shift your weight as your body guides you. As in yoga, follow your breath while you do these exercises. Only do that amount of pressure where you can continue to comfortably breath. If you hold your breath your muscle will not release. Only apply as much pressure that causes mild pain. If the pressure causes sufficient pain to make you hold your breath, back off a bit and start to deeply breathe again. Try the pressure again until you can continue to breathe deeply. This make take several days to achieve. If you have severe pain anywhere in your shoulder, do not perform these exercises. Pay attention to your body's sensations, to the knots and tension. Open your heart to the message your shoulder area brings. Allow your shoulders and the tension to let go. Breathe deeply. Let go. Eventually the muscle will release. So too, your emotions and your need to control. Let go of this need. Open yourself and your shoulder to let freedom, hope and joy in. Foam Roller Exercise Video to Open the Shoulder, the Shoulder Muscles, Ligaments and Tendons. For these exercises you can use any size round foam roller. First foam roller exercise: Lie down on the floor, onto your side. Place the foam roller at a comfortable spot under your armpit perpendicular to your body. Roll back and forth, log rolling your entire body. This is a cross fiber massage of the top of the pectoral muscle where it attached to the shoulder at the top of the humerus. As you roll front and back, stop and stretch any sore areas for 10-20 seconds, roll off the sore spot to allow the blood to flow back in, then go back to the sore spot and apply pressure for another 10-20 seconds. Remember to breathe! Second foam roller exercise: Place your foam roller on a table somewhat parallel to your upper body, but at an angle to hit the top of the shoulder at the anterior deltoid muscle and the bicep tendon. Extend your arm almost parallel to your upper body, with your palm turned down, and your thumb pointing toward your body. Roll the anterior deltoid, up and down the arm in small movements, aiming for the top of the humerus or the boney prominence in the front of the shoulder. Hold the pressure at the sore spots as described in exercise one. For the third foam roller exercise keep the foam roller on the table in front of you. Place the roller under your armpit. Bend at your elbow with your hand behind your ear. Roll the muscles under your armpit, leaning either to the front or back or both as you find the area of soreness. Depending how you lean, towards the arm will hit the triceps, toward the body will hit the latissimus dorsi, the infraspinatus and the teres muscles. For the fourth foam roller exercise, position the roller on a table, parallel to your upper body. Now extend your arm out perpendicular and place your foam roller under the front part of your shoulder at the anterior deltoid. Roll in small movements along the front of the shoulder. For the fifth foam roller exercise lie on the floor, on your side. Position the roller under your side. Roll up and down your side, up and into the armpit, by pushing off with your feet. This foam roller exercise targets the latissimus dorsi mostly, but also hits the serattus muscles of the upper ribs, the infraspinatus and the teres muscles. In addition to the foam roller exercises, I have created some unique shoulder stretches on the foam roller. Follow the pictures below for additional foam roller shoulder stretches. Just hold the shoulder stretch on the foam roller like a yoga pose, as you sink into the stretch and feel your shoulder, upper back and neck open up. After 20-30 seconds or so, try very small rolling movements to vary the pose slightly as you feel the need to open a slightly different area. Then try to raise your hips in a bridge position to see if that movement ads pressure to your sore area for even more opening. If that feels too hard, just lower yours hips again. Lower your arms and raise them again, to feel a different stretch. Experiment until you get it right for you. 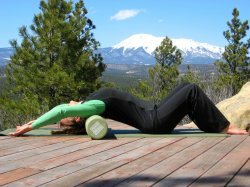 Foam roller exercises are a great way to stretch your body and 'stretch your mind' and heal your body-mind-soul. When you stretch, you create space in your body and also in your life! May this article start you on your journey to better health, by releasing your burdens. 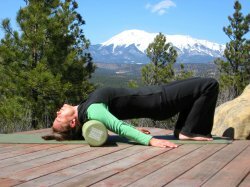 May these foam roller exercises and stretches designed to open your shoulders utilize self-myofascial release as a means toward healing your being, body, mind and soul.